The Venture Bros. - The Amazing Shirt of the Week Club - This Week's Shirt! Each week we premiere a brand new episode of The Venture Bros. television program, we will premiere a brand new t-shirt to go with it RIGHT HERE. The shirt will remain on sale for one week only--until the next episode and the next shirt premiere. We'll only print as many shirts of each design as we receive orders for (okay, we'll probably make a couple for ourselves, too) and once the ad for a shirt is removed, that shirt will never be available again. Venture Bros. Shirt Club shirts will all be printed on only the finest American Apparel shirts available, and each is priced at $22 ($23 for 2XL). Each shirt is thematically tied in to the episode it premieres with and every shirt is different. 13 episodes, 13 shirts. So, what's the smart-dressed Venture Bros. fan wearing to the candlelight vigil? 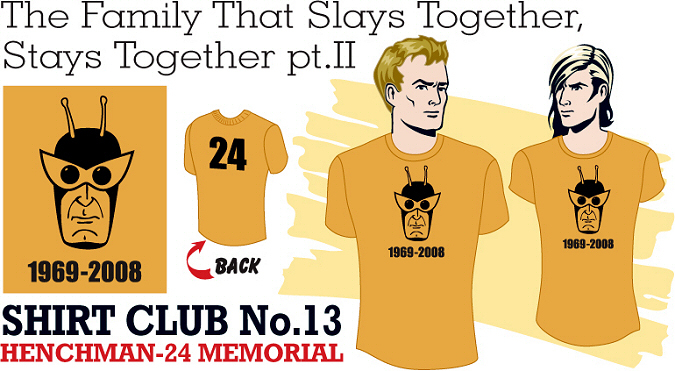 Honor a man of distinction and bid a final farewell to everyone's second favorite henchman in this specially crafted, double-sided goodbye garment--The Henchman 24 Memorial T-Shirt. You won't find a more fitting tribute (get it? fitting?) to the murdered minion than this 100% cotton, wearable tombstone... because it comes in both Men's and Ladies' sizes! Which is just the way 24 would have wanted it. All Venture Bros. Shirt Club shirts will be shipped via First Class U.S. Mail. Shipping is included in the price of the shirt. A $3.00 (USD) surcharge will be added to international orders. Please allow 3-5 weeks from time of order for delivery. Shirt Club shirts are non-refundable and we do not accept exchanges (we're seriously too busy making a TV show to deal with all that paperwork). This is why we include a size chart with each t-shirt design, so you can order with confidence. But be advised: American Apparel t-shirts are sized very accurately for a "fitted look." Speaking of those size charts, find the male/unisex size chart here and the female size chart here. Pages generated by One Tusk Industries.